For a couple years now I have been bringing up the topic with friends (and anyone else interested enough to listen) about what I call Nature Deficiency Syndrome. 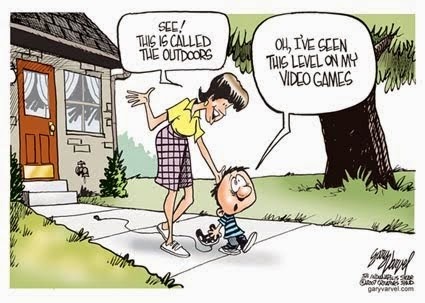 What it is is when people are so deficient in spending time outdoors that they develop behavioural problems like Obsessive Compulsive Disorder, Attention Deficit Disorder, Attention Deficit Hyperactivity Disorder, various eating disorders and many other mental disorders - all because they have become disconnected from the natural world. However I am apparently not alone in this idea. "Nature Deficit Disorder" is basically the exact same thing, different name, and refers to a hypothesis by Richard Louv in his 2005 book "Last Child in the Woods". So apparently he thought of it first, and apparently his version is limited in scope to children - ignoring the fact that adults could also be suffering from "Nature Deficit Disorder" or NDD. Note - NDD is probably the better acronym because NDS is more commonly the acronym for National Defense Strategy. But whatever, lets not quibble over names and acronyms. Regardless of what you call it (and who thought of it first), the idea is that people (not just children) are feeling isolated in cities and disconnected from the way mankind was meant to be. We evolved living under blue skies and in green forests, surrounded by nature. We were never meant to build cities and skyscrapers, it is contrary to our genetic code to live surrounded by glass, concrete, and stainless steel. Now maybe, someday, after millions of years of evolution has gone by where mankind has been living in such buildings all that time and possibly even going their whole life without ever seeing a real plant, then maybe mankind will have evolved to the point where they are no longer bothered by being disconnected from nature and suffering from Nature Deficit Disorder. There is a biochemical connection here too. Humans need Vitamin D, not just for their health but their mental health too. A lack of Vitamin D results in depression. If you read the last one it gets into how certain food deficiencies cause people to become depressed, suffer brain damage, and even become suicidal. If the lack of certain foods can do that, what does the lack of fresh air do? What does a lack of fresh air do to the human psyche? Just that alone probably causes mental problems, making people feel claustrophobic. Having fears of natural predators like snakes, wolves, bears, large cats - those are engrained in our DNA. As are fears of heights, flying, falling, tunnels, small spaces, drowning, water, etc. 1. Many phobias are connected to man's evolution within nature and tied to survivalism. 2. There is no documented cases of people being afraid of nature as a whole. There is no "nature phobia". It does not exist. What does exist however is lazy people who don't want to go outdoors and would rather sit inside and play Elder Scrolls - Skyrim, which oddly enough is about a hero who walks around in a world hunting monsters, mammoths, sabre tooth tigers, wolves, etc and completing quests that involve killing evil wizards and undead (because they're unnatural). That shows that people want those things, to hunt and gather outdoors - but they are lazy and want to do it from the comfort of their sofa. Ever lived in a tight knit community where you know all your neighbours' first and last names? What kind of psychological damage do you think people suffer from having no sense of community, possibly even being afraid to talk to their neighbours? I think they would be in a constant state of paranoia. That cannot be good for your psyche.